AP Polycet Results 2018: Andhra Pradesh Polytechnic Entrance Exam CEEP Result, Rank Card available at polycetap.nic.in, manabadi.com. Students can check their AP polytechnic result 2018 with ranks and Marks Secured in Maths, Physics, Chemistry in the official website from below. State Board of Technical Education and Training, Andhra Pradesh, Vijayawada informs that the results of Common Entrance Examination for admission into Polytechnic (POLYCET-2018) which was held on 27-04-2018 is scheduled to be released on May 10th at 9 AM by Hon’ble Human Resources Development Minister Sri Ganta Srinivasarao garu. The Andhra Pradesh POLYCET (Polytechnic Common Entrance Test) examination has successfully completed on 27th April, Saturday. Aspirants seeking Polytechnic/Diploma courses admission have appeared in massive numbers this year. As per the announcement by State Board of Technical Education, AP this year 1,34,635 candidates have applied for the AP POLYCET examination while 1,25,518 hopefuls have appeared for the examination. The analysis states that 93.23% of applicants have attempted the POLYCET examination this year. The AP Technical Education Commissioner has expressed this news to the media. As per the accurate reports, this year 85,879 Boys and 43,046 girls have appeared for the AP POLYCET examination in many examination centres across the state. Overall, the AP POLYCET examination has organized in 368 examination centres across AP. AP Polycet result will be release at official site manabadi and Polycetap.nic.in. The answer key for the AP POLYCET 2018 was already released. Candidates may check answers for all sets A, B, C and D.
The minimum marks for declaring a candidate to have passed in the Entrance examination shall be thirty percent i.e., 36 marks out of 120 for all category candidates, except SC and ST for whom there is no minimum qualifying marks, All the SC / ST candidates who have appeared for the POLYCET examination have qualified and have been assigned ranks based on their performance. Candidates belonging to Scheduled castes or Scheduled Tribes shall be assigned ranking irrespective of the marks obtained in the entrance test. Such candidates even less than 30% marks in POLYCET-2018 shall be eligible to compete for their category of seats during the admission. The marks obtained at the entrance test shall be considered for the purpose of assigning rank, on the basis of which, selection shall be made for admission into diploma courses. Every care will be taken to avoid errors in the valuation of answer sheets, tabulation of results and ranking of the candidates. Hence, request for revaluation or re-totaling will not be entertained under any circumstances. In case of tie in the total marks secured, the same has been resolved by awarding a better rank to candidate who secured higher marks in mathematics, and in case of the tie still persisting, by taking marks secured in physics into consideration. Candidates have been awarded the same rank on non resolution of tic based on the above criterion. Resolution of tie will be taken up based on Date of birth and total marks secured in SSC examination at the time of verification of certificates during web counseling when the data will be available. The result of AP Polytechnic Entrance Exam is going to be announced today (may 10th). The AP Polycet 2018 result will be declared on www.sbtetap.gov.in and Polycetap.nic.in. After declaration of AP Polycet Results by State Board of Technical Education and Training (SBTET), students may check AP Polycet result 2018 by using their registration number, roll number and name. AP Polycet Results 2018 Release Date? The Rank secured by the candidates will be intimated through SMS to the registered mobile numbers. The scanned copies of OMR sheets of candidates will be placed on the web site polycetap.nic.in. The students who have written the Polycet exam are waiting for the AP Polycet results 2018. The students can check their AP polycet 2018 results by following the below guidelines. 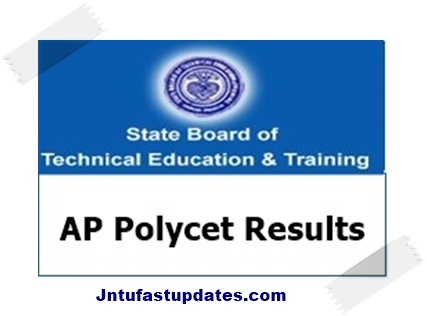 Click on the link “AP Polycet 2018 results“. Your Polycet results will be displayed on the screen. The students after the completion of their Polytechnic will continue their B.Tech in their respective colleges only; where they pursued the Polytechnic. That’s why POLYCET results are so important that the students 6 years of life will be decided on their exam. They can’t make a step backward after this. So Andhra Pradesh POLYCET Results will plays a key role in the students life. The results are likely to be declared within fifteen days from the date of test. Rank Cards will also be dispatched within a week from the date of declaration of results. The Candidates can download rank card from hptts://polycetap.nic.in or www.sbtetap.gov.in or from any help line centers or otherwise can contact coordinator of any helpline center for any further assistance. When does the results are declared? how find hall ticket no.